Volunteers are needed for the sixth annual Run for Faith, a 4.58 mile run that commemorates the life of Faith “Marcy” Romboldi. This year’s Run for Faith will take place on Sunday, August 14 at 8:30am at Plimoth Plantation. 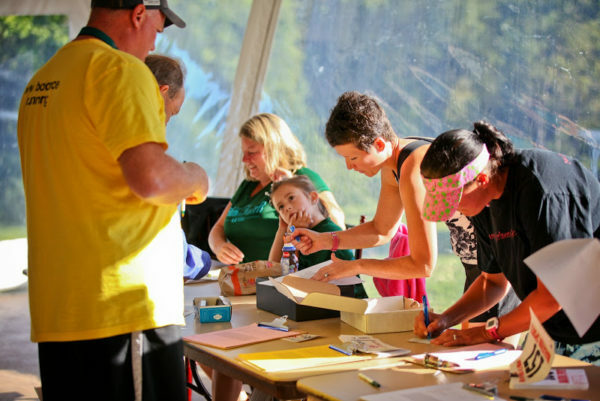 The sixth annual Run for Faith recently announced it is looking for volunteers to work registration tables, water stations and other day-of-race functions. The 4.58-mile race will take place at 8:30 am on Sunday, August 14 from Plimoth Plantation. “Our volunteers are the foundation of any run, but even more so with the Run for Faith. That dates back to the first year when the Run for Faith took place just before Hurricane Irene hit,” said Matt Romboldi, one of the founders of the race run in memory of his mother, Faith “Marcy” Romboldi, who succumbed to ovarian cancer in 2010. In its six year history, the Run for Faith has raised more than $100,000 for the aforementioned charities. With the 6th annual Run for Faith set for Sunday, August 14, organizers are counting on year six this 4.58-mile race to break previous fundraising efforts and volunteers are a significant part of that endeavor. Those interested in volunteering can contact Matt Romboldi at info@runforfaithplymouth.org. The 4.58-mile Run for Faith race loop captures spectacular views of Cape Cod Bay, the Eel River and scenic horse farms. The course features rolling hills and unmatched history. Water stations are plentiful and the event is chip timing for more accurate time tracking. This technology also triggers a camera along the course so runners can have a photo of themselves in action during the run. Walkers are welcome. The entry fee to run or walk in the Run for is $25 and runners can register at www.runforfaithplymouth.org. Day of the run registration is $35. Cash prizes will go to top three finishers, male and female, and awards will be given to top finishers for various age groups. Post-race “light refreshments” will include bananas, oranges, bagels, muffins and scones. To amuse younger family members, a jumpy house will be available. A number of vendors will be on hand to sell their wares before and after the race. The Run for Faith is organized by Run for Faith, Inc., which is 501(c)(3) non-profit organization created to commemorate the special life of Faith “Marcy” Romboldi who gave so much of herself to both individuals and the community. For more information, please visit www.runforfaithplymouth.org, or email info@runforfaithplymouth.org. You can view the course online at: http://www.mapmyrun.com/us/plymouth-ma/run-for-faith-plymouth-ma-route-115100461.